As I am pulling rusty fasteners from these frames I am reminded that everyone working in the lab really should have their tetanus shot up to date. In addition, you really shouldn’t work with rusty nails and framer’s points without protecting your hands. Don’t be like me. * I’ve asked Rachel to put cut-resistant Kevlar (R) gloves on our next supply order. *Yes, I have a broken finger. Even so, conservation work must go on. This month on the 1091 Project we take a look at our physical lab spaces, how they are set up and how our location impacts our work. The Verne and Tanya Roberts Conservation Lab is located on Lower Level 1 of Perkins Library, Room 023. We share this level with The Link, Digital Production Center (DPC), Preservation, and Shipping and Receiving. When you enter the lab you will see that the work benches are aligned along the left wall; the large equipment such as the board shears, job backer, cloth roll storage and standing press are in the center of the room; the washing sink, clean-up sink, flat file storage, rolling work table, ultrasonic polyester welder, and sorting shelves are to the right. We have several rooms within the space including a “dirty room” with fume hood, sink, Kwikprint and work table; the department head’s office; a store room for supplies; and a photo documentation room. This space opened in 2008 and was purpose-built as a conservation lab as part of the Perkins Project. You can see a virtual tour on Flickr, and there is a video near the end of this post. One of the challenges in designing the layout of the lab was the fact that we have several large columns in weird places around the room that cause bottlenecks in the flow of traffic through the space. Since these columns are holding up the building, we had to work around them to arrange the space to accommodate large equipment and the need to move materials through the room. Another challenge is navigating full book trucks through so many self-closing doors. If I could wave a magic wand and go back in time, I would invent the automobile ask for doors that open automatically in response to motion or the wave of your foot. The doors would also be wide enough to easily accommodate a truck of large, flat objects or supplies. Having the benches in a row encourages interaction between the staff. Being close to each other allows for easy collaboration and discovery, it’s easy to ask for opinions or to see what projects everyone is working on. It also allows for a more flexible space as you can use an empty bench behind you as a temporary landing space if you need to. 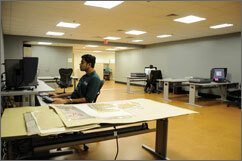 The separate spaces for the dirty room and photo documentation room allows that work to happen away from the main lab. For example, when someone is vacuuming mold in the fume hood, or taking pictures of their objects in the photo documentation room, the noise and visual disturbance is reduced and makes for a happier workplace. One of the benefits of the renovation was getting upgrades in ergonomic equipment and features. We have a cork floor that is easier to stand on all day, sit-to-stand benches that raise and lower at the push of a button, and special chairs (designed for dental hygienists) that are comfortable and supportive when you have to sit for long periods. We also have daylight balanced lights, which not only helps in color matching but are brighter and more cheerful to be under (in my opinion) when you have no windows in your space. Being in the basement has its disadvantages and advantages. We have to push carts through several doors, around many corners, and into an elevator to retrieve materials from the stacks. Driving book trucks safely around obstacles like these can be tricky. The biggest advantage to being in our space is…our space. In our previous location our supplies were on pallets on the floor in a public hallway that went through the middle of our two work rooms. The photo documentation setup was in my office, which was difficult for everyone. We had no room for a fume hood or washing sink. We now have a physical space that allows us to provide a higher level of service and to work more efficiently. I quickly shot a video of our lab early this morning before everyone arrived. Sorry about the wobbly picture but you get the idea of what the space looks like. The best thing about our space is that it is a gem in the crown of our renovated library. Our lab, the staff and the work they do have become one of the highlights of library tours. It is really fun to invite people “behind the scenes” to show off the great people I work with and the amazing things they do for the collections. Thanks for visiting us. 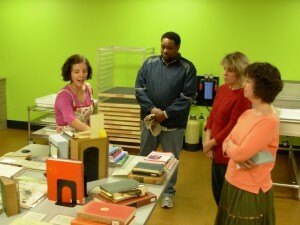 Be sure to head over to Parks Library Preservation to read about their space! This month as part of the 1091 project we are presenting an interview with our paper conservator, Grace White. Regular readers will remember that Grace joined the staff last year. Since then, she has worked on a variety of things including some very, very large WWI posters; she curated an exhibit on the tools of the trade; and has helped with a lot of the renovation prep, including the papyri rehousing project. Grace also writes the quarterly “What’s In The Lab” series for the Devil’s Tale. In this interview, Grace discusses what she does, how she came to the conservation profession, her favorite treatment as well as her favorite tool. Check out our other staff interviews from our “10 Years, 10 People” series, and be sure to click over to Parks Library Preservation for their interview! 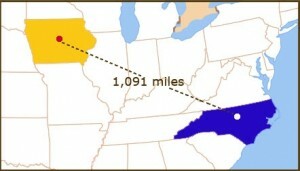 Welcome to the 1091 Project, a collaborative blogging endeavor between the conservation labs at Duke University Libraries and Iowa State Libraries. Today we are highlighting the kinds of training we do that supports the long-term preservation of our materials. Conservation Services provides training in both informal and formal ways. We are often contacted by Technical Services for advice on proper handling or housing procedures for fragile materials. Sometimes we get a call from the reading room requesting our help to show a patron how to turn fragile pages or unfold brittle documents. 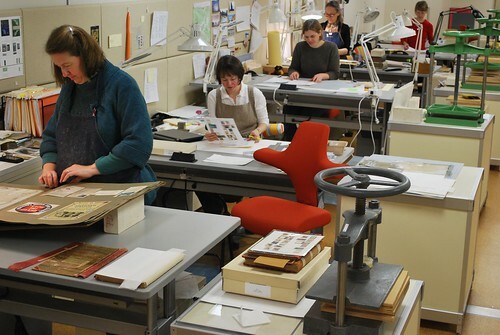 Conservation offers annual Care and Handling sessions for staff and student assistants. We usually offer multiple sessions in multiple locations to catch as many people as possible. For those unable to attend we put PDF’s of the handouts and Power Point slides on our intranet site (Duke NetID required). In these sessions participants learn how to identify damaged materials and what the process is to send them to Conservation. We also demonstrate proper handling techniques such as shelving spine down, how to safely remove books from the shelf, and packing book trucks and mail bins for transport. Because of the current renovation projects we may not be able to offer on-site training this year. To that end, I’ve updated our handouts and Power Point presentations and will make sure student supervisors know where to find them. We are investigating the use of short videos as a fresh and fast way to get information to our patrons, staff and students. This is our first video in the series. What do you think? What sorts of videos would you want to see or show to your patrons? We participate in the disaster preparedness and recovery training sessions offered by the Preservation Department. We work with the staff in the Digital Production Center and the Internet Archives to make sure they are comfortable handling fragile materials during digitization. Sometimes we will actually help during imaging for particularly fragile or delicate items. We train our Conservation student assistants and volunteers on how to repair materials and make enclosures.We couldn’t be successful without them! We train ourselves, too. Each month before our staff meeting we hold a Tips Session. If we discover a neat tool, or come up with a creative solution to a problem, we demonstrate it to the entire lab staff. These session are fun, fast and foster a lot of conversation and brain storming. Let’s go see what training Parks Library Preservation does. Please share your training regimen or ideas for videos in the comments. Winston Atkins, Preservation Officer for Duke University Libraries, offers tips and suggestions for storing newspapers from the recent historical election and inauguration. View details at the library’s YouTube site or read more from the Duke Office of News and Communications. Duke’s Working at Duke series interviewed Erin Hammeke, Special Collections Conservator. This series highlights a day in the life of Duke employees. In the video, Erin shares details about the items she repairs and preserves as a conservator for Special Collections.